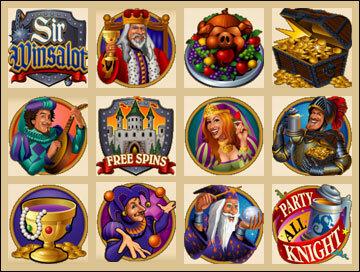 Sir Winsalot Slot Game was released on 2nd September 2008 by Microgaming. The graphics of the game have colorful, cartoony art style which is inspired by royal feast theme. The symbols on the reels include Sir Winsalot Logo, Party All Knight Logo, Castle, Sir Winsalot, Treasure Chest, King Winsalot, Princess, Wizard, Musician etc. In the background the game has a royal theme inspired music wherein trumpets and drums are played out, along with some authentic gameplay sound effects that loops. The highlight of the game is Beer Fest Bonus Feature. This royal themed slot game has a set of 5 reels and 20 paylines. The coin size varies in the denominations of 0.01 up to 0.25 per pay line, and wager 1 up to 5 coins per payline bet. The minimum bet amount is 0.01 and the maximum bet amount is 25.00 per spin. The maximum jackpot payout of the game is 1,000 coins per line bet. The game features Scatter symbol, Wild symbol, Beer Fest Bonus and a Free Spin Bonus Round. The Sir Winsalot Logo symbols in the wild symbol in the game. It acts as a substitute for other symbols to complete the winning combinations, except the scatter symbol. This symbol can also appear stacked on one another making it stacked wild. The Party All Knight and the Castle symbol in the game are the scatter symbols. The Party All Knight symbol can appear anywhere on five reels to complete the winning combination, provided two or more of these appear. Three or more of these appearing anywhere on the reels activate the Beer Fest Bonus Feature. The Castle symbol can appear anywhere on five reels to complete the winning combination, provided two or more of these appear, three or more of these scattered anywhere on five reels will activate the Free Spin Bonus Round. Three or more Party All Knight scatter symbol scattered anywhere on five reels activate this feature. In this feature player gets a chance to choose three Beer Mugs out of tem displayed to reveal the random Bonus prizes. This feature can also be triggered during the free spin bonus round. Three or more Castle scatter symbol scattered anywhere on the five reels activate this feature. In this feature, player is awarded 10 Free spins with 3x multiplier. The Free Spins can be re-triggered. The game has a funny royal theme with some King Arthur vibe to it, and it features symbols like the hilarious knight, the treasure chest, the wizard, a cooked pig, or Sir Winsalot himself.